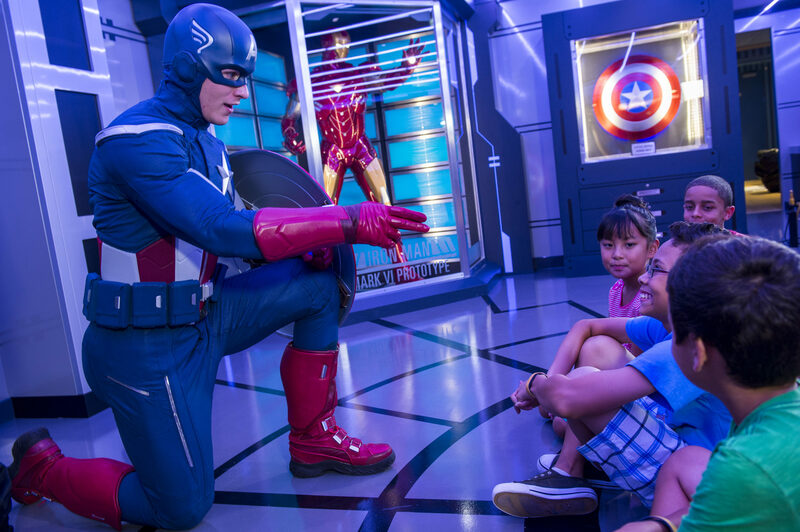 The Disney Parks are fabulous for a fun family vacation, but they are crowded and filled with gadgets and gizmos that may distract your children. Follow these important tips if your child gets lost at Disney, and your family will be reunited quickly. 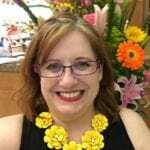 When my daughter was a toddler, she wandered away from me at Walmart. I was at the eye center, and I moved from the technician’s desk to the checkout. My daughter lost track of me and decided to go out to our car. The few minutes after I realized she was missing were agonizing. I ran straight to the exit where a customer confirmed that she saw my daughter walk out the door. I caught up with my daughter as she was heading across the street to the parking lot. It was all I could do not to fall apart into a puddle of happy tears. My local Walmart isn’t nearly as busy, or as interesting, as a theme park. Disney has “gadgets and gizmos aplenty” and “whos-its and whats-its galore” that will distract your child and tempt them to wander off. Here are my tips on how to prepare in case your family gets separated, and what to do if your child gets lost at Disney. Put an ID tag on your child. An ID is essential for children who do not know their parents’ names and cell phone numbers. When my kids were little, I made a laminated badge for each child and pinned it to their shirt. On the front side of the tag was a picture of their favorite Disney character, and on the back was the full names of every adult in our party along with the adults cell phone numbers. Keep in mind that experts recommend that you never put a child’s name in a visible place that may put them on a “first name” basis with an abductor. You can also find ID tags online or make pet tags which your child can wear as a necklace or on their shoelaces. There are even temporary tattoos with spaces to write in your contact information. Of course, you could always use a Sharpie to write your phone number on your child’s arm. Don’t laugh. I have seen it done before. I am a big fan of dressing the family in matching shirts or at least in matching colors. Not only does it make it easy to spot your family in a crowd, but it is also easier for Cast Members to figure out who is in your party when you enter an attraction. Before you leave your hotel room for the day, each adult should use their phone to take a picture of the kids. With a current picture, it will be easier for a Cast Member to broadcast an accurate description to the internal Disney network. Teach your kids how to identify Cast Members by their name badge, and instruct them to immediately find a Cast Member if they cannot find you. They can even practice finding and approaching a Cast Member. Parents get lost at Disney almost as much as sunglasses and water bottles. And I do mean parents because your child knows exactly where she is even if you don’t. Stay where you are and take a quick look around. As soon as you misplace your child, stop in your tracks and take a quick look around. More than likely, the child is close by, and you haven’t spotted him in the crowds. DO NOT waste time trying to find your child. The parks are too crowded to hunt for someone, and you are likely to lose track of even more family members. 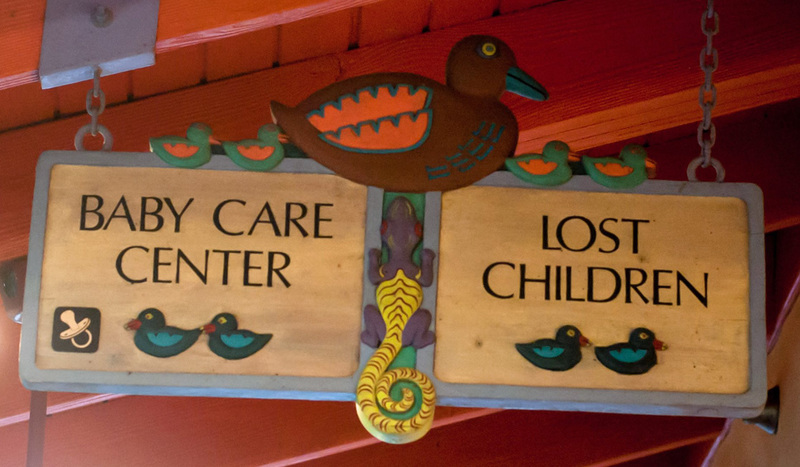 Find the nearest Cast Member and let her know you lost your child. She will broadcast an internal notice and every Cast Member in the park will be on the lookout. In fact, there is a good chance that a Cast Member found your child before you realized he was missing. I know from experience that Cast Members are proactively looking for separated children. As a toddler, my daughter climbed to a landing in the Boneyard Playground in Disney’s Animal Kingdom. I watched as a Cast Member checked my daughter’s tag (see the tips below) and asked her where her parents were. Try not to embarrass your child with hugs and kisses when you are reunited. 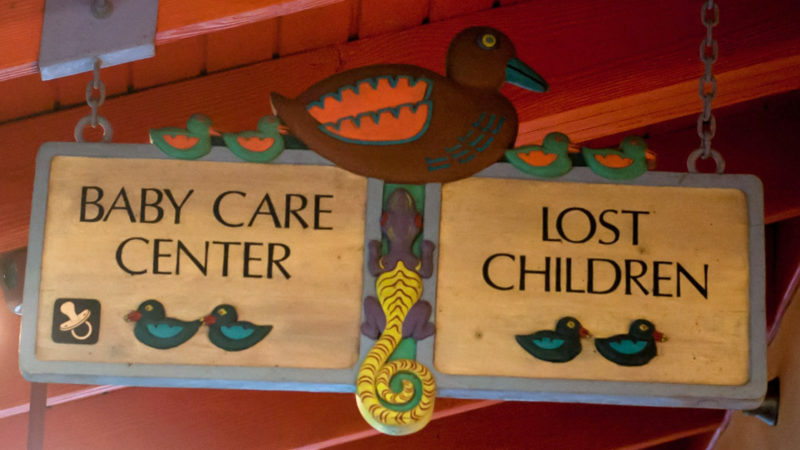 If a Cast Member finds your child before you realize they are missing, the child will be brought to the park’s Child Care Center to wait. If your child is still missing, the Cast Member will most likely instruct you to stay with him while he monitors the search through internal communication. Remember, YOU were the one that got lost, not your child. It is likely that she was having a great time in your absence. So, try not to embarrass her with too many hugs and kisses. Lost children aren’t the only safety concern on your Disney Vacation. Learn more about how Disney is Wild About Safety in their theme parks. 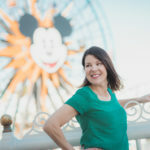 Suburban TravelingMom Jamie Bartosch shares her Tips for Not Getting Lost at Disney World and Spontaneous TravelingMom Amanda Topinka tells us about Losing a Child at Disney World. Has your child ever gotten lost on vacation? What did you do? Do you have any tips to share with other parents? My special needs stepdaughter ran off on our last trip when she got upset about something. The cast members stayed very calm and had a call out within 5 minutes. Fortunately she was just hiding out in the bathroom & we found her within about 10 mins but it’s a very tense time! I’m glad everything turned out okay. It is scary to lose track of a child.